10.30am Morning Worship and Confirmation. Led by Rt Rev Peter Hancock, Rev Clive Jennings and Rev Russell Herbert. Please come early or stay for Coffee. 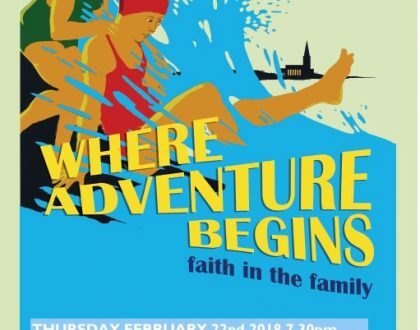 We are very excited to be hosting a New Wine Riding Lights touring theatre show called Where Adventure Begins: Faith in the Family. It is a brilliantly entertaining show – ‘real, touching, hilarious and unmissable’. Thursday 22nd Feb 7.30pm at Christchurch. Buy tickets for £10 at new-wine.org/adventurebegins. Please spread the word and get your tickets early if you are keen to come along.